The electrical engineering sector and the Saarland region have lost one of their most outstanding entrepreneurial personalities in Oswald Hager. Hager Group must bid a sad farewell to the company's founder and long-standing managing director; a man who was held in very high regard by employees, partners and customers of the company. Oswald Hager was born in Ensheim, Saarland, in 1926. He served in the military, was held prisoner, and then in Winter 1946 started studying business management at the Wolfgang-Goethe-University in Frankfort. He got a degree and completed his doctorate. After numerous professional experiences in Germany and France, he founded Hager OHG with his father and brother Hermann in 1955 in the Saarland which was, at that time, independent. The three-man business experienced its breakthrough with the introduction of a distribution board system developed by Oswald and Hermann, which replaced the wide range of meter board systems available at the time. Over the decades, the classic distribution cabinet evolved to become what is now the Hager energy distribution system boasting a modular structure which now provides millions of homes with a secure energy supply. Oswald took care of the commercial side of the company. For him, everything always revolved around close contact with customers. Countless visits, his persuasiveness, down-to-earth-attitude, human touch and his humour played an important role in convincing customers to place their trust in the products offered by this industry newcomer. Close contact with customers is still an important element of Hager Group corporate culture. Dr. Oswald was also responsible for developing and maintaining a characteristic Hager style in design and communication to give the company's products and solutions a high recognition factor. Dr. Hager once described the secret to the company's success as follows: "We have always listened to the market and our customers. We have systematically developed our products and services with them in mind." This was how Hager Group, a company based in Blieskastel, Saarland, grew to become an internationally successful player. Oswald Hager's son Daniel took over in 2008. As well as being active on the business scene, Dr. Oswald Hager also had a keen involvement in matters relating to economic and social policy in his roles in organisations such as the German Electrical and Electronic Manufacturers’ Association (ZVEI) and the Central Association of German Electrical and IT Trades (ZVEH), as well as on the committee of the Federation of German Industries (BDI) and as vice president of the Saarland Chamber of Industry and Commerce (IHK). Oswald Hager campaigned for industrial matters close to his heart in magazine articles, personal letters to politicians and memoirs, such as the ‘Confessions of two Entrepreneurs’, which he wrote with his brother in 1977. "The greater the degree of independence afforded by an economic system, the greater the possibility that everyone will be better off, progress will come about more quickly, people will have more freedom, and our work and achievements will bring happiness." In his private life, Oswald Hager was an anchor for his family. He married his wife Ulrike Geiges in 1967, then three years later his son Philipp was born, followed by his second son Daniel in 1972 and his daughter Isabel in 1986. He also leaves behind five grandchildren. Dr. Hager was a passionate golf and card player; he found relaxation here with his friends. Oswald Hager celebrated his 90th birthday on 16th November 2016 surrounded by members of his family. Numerous guests from the company, the political world and reputable associations joined long-standing business partners and customers of Hager Group at the official party at the Blieskastel site a few days later. 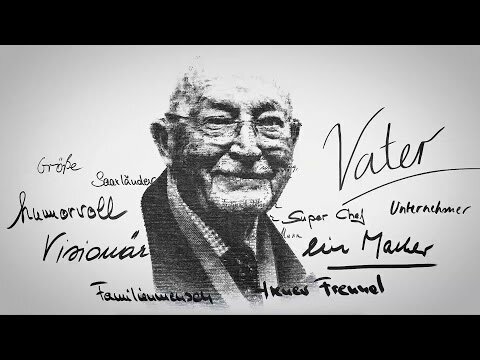 Holger Heckle, CEO of the German Association of Electrical Wholesalers (VEG) described Dr. Oswald Hager as an extraordinary person in his speech: "He is an exemplary entrepreneur who has always put his company, employees and customers first." Just weeks before his death, Dr. Oswald Hager was awarded the Saarland Order of Merit (Saarländischen Verdienstorden). Annegret Kramp-Karrenbauer, Saarland’s Minister-President awarded him the honour "in recognition and appreciation of his outstanding services to the Saarland region". In fact, his accomplishments reached far beyond the borders of the Saarland region and Germany. 11,650 employees along with countless partners, customers and peers from all over the world take a bow to the achievements of this outstanding man. Tribute to Dr. Oswald Hager in the context of his 90th birthday in November 2016.